Prescriptions for dangerous alternatives to OxyContin are soaring, showing that a crackdown on the popular painkiller has failed to curb Canada's opioid crisis. OxyContin, a brand-name version of oxycodone, was once the top-selling long-acting opioid in Canada. But it became a lightning rod in the early 2000s as reports of addiction and overdose exploded, prompting every province except Alberta in 2012 to stop funding the drug and its reformulated, tamper-resistant version, OxyNEO, which is difficult to crush or chew for a quick high. Similar restrictions were not placed on other addictive opioids, a move many experts say had the unintended consequence of shifting patients from one drug to another and escalating the prescription-drug crisis. The shift to other opioids has helped Purdue Pharma Canada, the manufacturer of OxyContin and OxyNEO, remain a key player in Canada's opioid market. Hydromorph Contin, also made by Purdue, is now the most popular long-acting opioid in Canada, with prescriptions reaching 1.6 million last year, up 60 per cent since 2011, according to a Globe and Mail analysis of figures provided by IMS Brogan, which tracks the drug industry. Hydromorph Contin is covered by every province's public drug plan with the exception of B.C. and Prince Edward Island. BuTrans and Targin, two other opioids sold by Purdue, are not covered by any provincial drug plan and make up a small portion of the overall opioids market. But they are also experiencing explosive growth. Prescriptions for BuTrans have risen nearly 83 per cent since 2011, with 2014 sales reaching nearly $13-million. Targin prescriptions have soared 216 per cent. Prescriptions for tamper-resistant OxyNEO have remained stable since the drug was introduced in 2012, with 841,806 prescriptions dispensed last year, according to IMS. Together, the drugs are contributing to a spike in opioid prescribing. 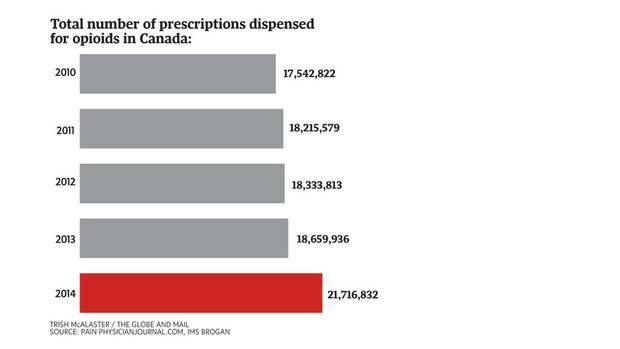 In 2012, the year OxyContin was delisted from provincial drug plans, 18.3 million opioid prescriptions were dispensed in Canada. Last year, that figure jumped 18.6 per cent to 21.7 million, according to IMS. Fischer, senior scientist at Toronto's Centre for Addiction and Mental Health. "We need to rein in excessive prescribing," he said in an interview. "When we do that, then we will likely make a dent into this problem. Right now, we're not." Canada is the world's second-largest per capita consumer of opioids and the fallout is being felt across the country. Last week, a report found that from 2009 to 2014, at least 655 Canadians died as a result of fentanyl, a powerful opioid that is available by prescription and is also manufactured in clandestine labs and sold on the street. In June, the federal government announced a plan to require all oxycodone products – but no other opioids – to be tamper-resistant. David Juurlink, head of clinical pharmacology and toxicology at Toronto's Sunnybrook Health Sciences Centre, said the move will not be effective unless it is applied to the entire drug class. Recreational drug users are only part of the problem, medical experts say. The growth in Purdue's sales corresponds to the company's efforts to promote its non-tamper-resistant opioids to doctors through a series of prominent advertisements in the Canadian Medical Association Journal. In the months leading up to OxyContin's replacement with tamper-resistant OxyNEO, Purdue ran eight half- and full-page ads in the medical journal promoting Hydromorph Contin as "a recommended first-line option for severe pain." Purdue ran 14 double-page ads for BuTrans, a transdermal patch, in the CMAJ from January, 2012, to April, 2015, telling doctors to "experience the benefit" of "the first and only pain treatment with 7-day dosing" in Canada. Similarly, Purdue ran 11 ads for Targin in the same time period. At the Canadian Pain Society conference in May, which hosted pain doctors from across the country, Purdue had a prominent booth flanked by large advertisements for BuTrans, Targin and OxyNEO. Employees handed out promotional brochures to physicians and other conference attendees. Many experts are particularly concerned about the explosive growth of Hydromorph Contin. Meldon Kahan, a Toronto addiction specialist, said the drug comes in "dangerously high formulations" much more potent than OxyContin. He said it is "hypocritical" of Purdue to promote the safety of OxyNEO, yet continue to promote some of its non-tamper-resistant drugs that could easily be abused. Dr. Juurlink questioned why Purdue has not already introduced a tamper-resistant version of Hydromorph Contin, given the rising rates of opioid abuse and addiction. "There's no obvious reason why they haven't already done so," he said. In an e-mail, Purdue spokeswoman Lucy Lai said the company is pursuing tamper resistance for Hydromorph Contin, but that it takes time. 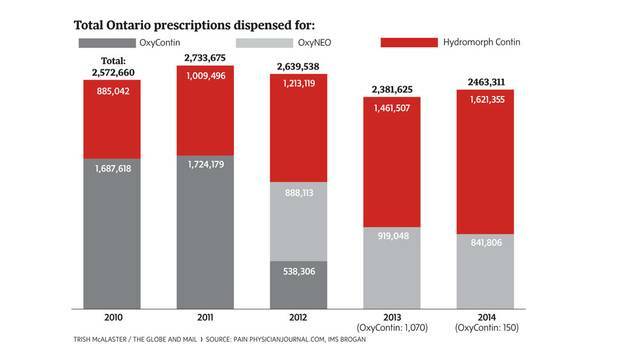 Ms. Lai said the rise in Hydromorph Contin prescribing is because most provinces do not cover OxyNEO. She noted that the company has not advertised Hydromorph Contin in journals since September, 2012. The company will "continue to support" Targin and BuTrans for treatment of pain, she added. 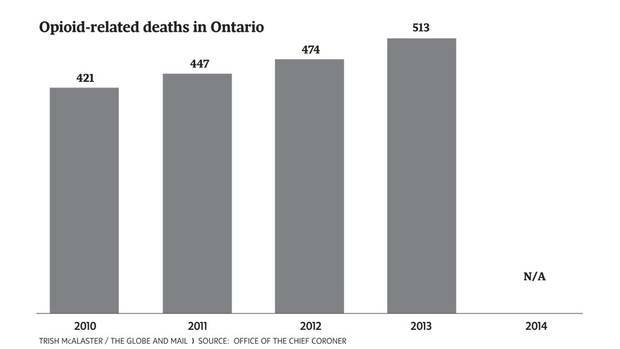 Asked why the government continues to fund Hydromorph Contin despite high rates of addiction and abuse, Joanne Woodward Fraser, a spokeswoman for Ontario's Health Ministry, cited a provincial program to monitor narcotic prescriptions. Karen Scott, a spokeswoman for New Brunswick's Health Department, said the drug is covered because "it is an important treatment option." Kelly Lanktree of London, Ont., is living proof of the damage caused by the singular focus on OxyContin. Ms. Lanktree, 27, was first prescribed OxyContin after falling down stairs and badly injuring her knee in 2009. Within a few months, she was dependent on the pills. As her tolerance grew, she began chewing, snorting and eventually shooting the drugs to get high. In 2012, her doctor told her that OxyContin was no longer available and wrote her a prescription for OxyNEO. Ms. Lanktree quickly realized she could not chew or snort the new version, so she returned to her doctor to ask for a prescription to Hydromorph Contin. She said he did not hesitate to write her a prescription, even though she displayed all of the classic signs of addiction, including track marks on her arms. Hydromorph Contin gave her a "more stronger euphoric hit" and made her addiction to opioids that much worse. Soon after, she and her husband, who was also addicted to opioids, ended up on the street. It was a turning point that persuaded them to seek treatment and more than three years later, Ms. Lanktree said, they are still clean. She still has a hard time comprehending how a simple prescription to help her cope with an injury nearly destroyed her life. "I had no idea they could be as addicting and powerful as they were," she said in an interview. "Nobody's really immune to this. It could be anybody." Why is there a prescription-drug crisis? Until the mid-1990s, opioids – a class of drugs that includes morphine, oxycodone and hydromorphone – were used mainly by people who were dying or experiencing severe, acute pain. The introduction of drugs such as OxyContin, which were designed to release analgesic effects over many hours, led to an increase in prescribing opioids for chronic pain. But what many did not appreciate is the fact that opioids also come with an inherent addiction risk. People who take them can become dependent in as little as a few weeks. Some people would also chew or crush prescription opioids to release all of the active ingredients at once as a way of getting high, which is how OxyContin earned the nickname "hillbilly heroin." But OxyContin was taken off the market in 2012. How is it possible that prescription-drug abuse is still a problem? It's true that Purdue Pharma Canada replaced OxyContin with a tamper-resistant version called OxyNEO in 2012 that is harder to crush. Many provinces stopped funding both drugs that year. However, there are numerous other opioids on the market that provincial drug plans continue to cover. As a result, the number of prescriptions for opioids has gone up across the country despite OxyContin's being phased out. How do we solve this crisis? Federal and provincial governments have adopted a number of measures, such as funding restrictions or prescription-monitoring programs to address the issue. But many addiction experts say the key is in drastically reducing the number of prescriptions written for opioid drugs. While chronic pain remains a serious issue, there is no high-quality evidence showing that opioids work for long-term pain. As a result, more members of the medical community are pushing for doctors to reduce opioid prescribing. 1996 Health Canada approves OxyContin, a brand-name version of the drug oxycodone, for sale in Canada. It is marketed as a long-acting drug that can be used to treat chronic pain. 2001 Media reports in the United States begin to refer to OxyContin as "hillbilly heroin," as reports emerge of people using the drug to get high and becoming addicted to it. 2004 Health Canada launches a review of opioid prescribing in Atlantic Canada following growing evidence of addiction, overdose and death. 2012 Provinces across Canada announce that they will no longer pay for OxyContin under public drug plans, as a way to address rising rates of prescription-drug abuse. Meanwhile, Purdue Pharma Canada replaces OxyContin with OxyNEO, a version of the drug that is harder to crush, chew or snort as a way of getting high. All provinces, with the exception of Alberta, do not cover the cost of OxyNEO. 2013 The popularity of OxyContin alternatives rises. Prescriptions for Hydromorph Contin, a potent long-acting opioid sold by Purdue Pharma, increase 20 per cent. June, 2015 Health Canada introduces a proposal that would require all oxycodone products to be tamper-resistant. Because Purdue Pharma holds patents on its tamper-resistant technology for OxyNEO, all generic oxycodone products would be forced off the market if the change is approved. At the same time, an article written by addiction experts in the Canadian Medical Association Journal questions why the government is not making all opioids tamper-resistant as a way to combat abuse. July, 2015 B.C. health officials warn about the dangers of illicit fentanyl, which has been linked to several deaths, including the parents of a two-year-old. Although fentanyl is a prescription drug, the current rash of deaths is tied to drugs manufactured in black-market labs.